QUEZON CITY – A labor group has joined the crescendo of peoples’ organizations calling for the ouster of President Noynoy Aquino from office, this came after Aquino refused to accept the resignation of Butch Abad as Secretary Budget and Management over the public uproar on their Disbursement Acceleration Program (DAP). Workers under the militant Bukluran ng Manggagawang Pilipino (BMP) bearing axes made out of cardboards, streamers and placards with “Patalsikin si Aquino, Itakwil ang gobyernong elitista” and “Abad, arkitekto ng DAP, Aquino, mastermind ng DAP” slogans held a protest action at Department of Budget and Management and also at Mendiola Bridge to call for the ouster of both DAP signatories. “Even before the Supreme Court’s decision on the DAP, workers and the toiling masses have long been suffering heavily from Aquino’s economic policies. For the wage-earners, Aquino’s DAP is just the icing on the cake. We can no longer stomach another day with him at the helm”, said Leody De Guzman, national chairman of BMP, in an e-mailed statement to the media. “For the past four years, Aquino’s regime exacerbated the already extremely miserable conditions of workers with the legitimization of contractualization, stagnant wages, double-digit unemployment rates, abandonment of social services and policies that placed profits of private companies over peoples’ interests,” De Guzman cited as the deep-seated issues that founded BMP’s position to call for Aquino’s ouster. The BMP leader explained that the intoxicating mantra of Palace officials and allies in the Batasan Pambansa that the DAP was “implemented in good faith” and that it “benefitted the economy” is a mere pretense to paint a picture of the nation’s economic and political health. “Aquino’s much-vaunted impact of his DAP on the economy does not translate to living wages, job security and recognition of our constitutionally guaranteed rights. Aquino may fool anyone but he will not fool the lowly wage-earners for they are the ones who have religiously paid their taxes and yet get nothing in return from this corruption-riddled government,” he added. De Guzman claimed that if there were any direct beneficiaries of the DAP; these would be the cronies and relatives of Aquino who were generously awarded with abundant government contracts. He also pushed for the full-disclosure of the bidding process and transactions with private companies and individuals that were awarded with projects from DAP funds. On Abad’s resignation from the Budget post, the labor group called it a “moro-moro”, explaining that it was merely the administration’s ploy to cleanse their guilt in public and end the public outcry for accountability. “To begin with, Aquino has no moral ascendancy to neither accept nor reject Abad’s resignation, given that both of them are implementers and signatories to the illegal disbursement of public funds. More importantly, they willfully hid it from the public and used it to undermine both the legislative and judiciary branches, De Guzman asserted. Meantime, reacting to the Palace announcement that Aquino shall address the public Monday night, Anthony Barnedo of Kongreso ng Pagkakaisa ng Maralitang Lungsod implied that, “No amount of hijacking of the airwaves will be able to discourage the poor and desolate from continuously pouring into the streets and set in motion Aquino’s ouster from office”. The groups expect Aquino to unleash a bundle of falsified government statistics, motherhood statements and shallow reforms to justify the usage of unused funds. “Aquino and cohorts are but shameless freeloaders,” the urban poor leader maintained. CATBALOGAN CITY, Samar – The 8th Infantry (Stormtroopers) Division recently held a Mountain Bike Challenge in Catbalogan City as a prelude in celebration of its 26th Founding Anniversary on Aug 1, 2014. 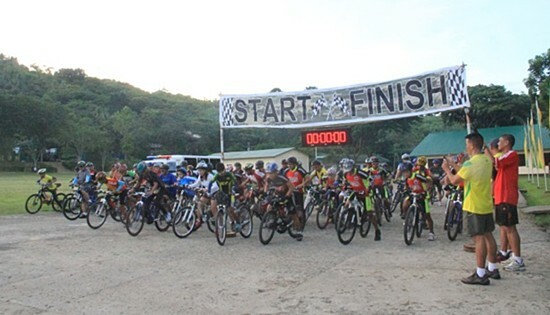 The mountain bike challenge has 12.1 kilometers circuit and runs along the rugged terrain along the vicinity of Headquarters 8ID and Catbalogan City. The mountain bike challenge has 58 mountain biker participants composed of 40 bikers from the Army led by Maj. Gen Jet B. Velarmino, Commander 8ID and 18 civilians. The race started at 5:00 a.m. The first finisher clocked-in 26.7 minutes. The following were the top ten participants: Mark Johncine Abay - 1st, Benjamin D. Solarte - 2nd, Henry T. Castillo - 3rd, Raymar M. Cruz - 4th, Major Angelo D. Malaran - 5th, Pfc Ardel P. Calvintos - 6th, Sergeant Aris M. Gacula - 7th, Corporal Reyno B. Marines - 8th, Private First Class Gerome D. Lebiste - 9th and Pernito A. Zeta Jr. - 10th. The top ten finishers were awarded with trophies by Maj. Gen Velarmino after the race. Other sporting challenge slated to be conducted at Headquarters 8ID are: Badminton Competition - July 20, 2014; Shooting competition dubbed as “Band of Brothers Shooting Events” - July 26, 2014 and Lawn Tennis Fellowship - July 27, 2014. CATBALOGAN CITY, Samar – The 8th Infantry Division conducted the “Stormtroopers Trail Run” on July 12, 2014 as a prelude to a series of activities in celebration of its 26th Founding Anniversary on August 1, 2014. 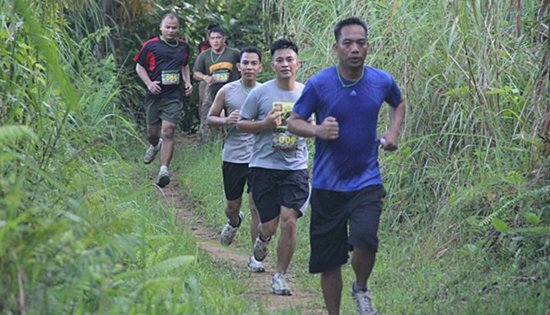 The 9.1 kms trail run circuit was designed along the trails and ridges passing along the hills adjacent to Headquarters 8ID and Catbalogan City. 163 runners participated in the challenging running event composed of running enthusiasts from Catbalogan City and personnel of 8ID. Gun start was at exactly 5:30 a.m. The first finisher clocked-in at 48 minutes. The following were the top 5 male and female participants. For the male category: Mc Allan Latoja - 1st, Captain Albert P Guloy - 2nd, Richard O. Oblino - 3rd, Corporal Rolando Villa - 4th and Private First Class Ranny Rodrigito - 5th. For the female category: Leonila Tan - 1st, Mary Grace Solarte - 2nd, Marilyn Solobayba - 3rd, Ethyl Marie Cailo - 4th, Corporal Dally Lagawad - 5th. The top 5 male and female participants were given trophies as top finishers of the competition by no less than the Commander of the 8ID, Major General Jet B Velarmino AFP in a simple awarding ceremony at the finish line. For most of the participants who experienced the trail run for the first time, the excitement was the challenge of the terrain, and the experience of enjoying the joy of running with mother nature. TACLOBAN CITY – Do you have a personal story to tell of witnessing or benefitting from the heroism or bravery of people during Super Typhoon Yolanda and its immediate aftermath? If so, now is the chance to let the world know, through the Yolanda Heroism Award of the Department of the Interior and Local Government (DILG) Region 8. The award, which seeks to recognize people who risked their lives in the service of the community during the brunt of Super Typhoon Yolanda and to glorify exemplars of the virtues of courage, selflessness, gallantry, bravery worthy of emulation, will be conferred by DILG-8 in time for the first anniversary of the typhoon on November 8, 2014. Nominations, which shall be for two categories: Acts of Valor and Acts of a Good Samaritan, is already open and will last until the end of July, said DILG-8 Regional Director Pedro A. Noval Jr., who conceptualized the award. Winners will receive both plaques of citations and a soon-to-be-determined cash reward. “In many ways, the storm, which was the strongest ever to hit land, tested the resolve and character of the people. The award is thus a fitting tribute to the individuals who performed extreme acts of selflessness and sacrifice during and after Yolanda,” said Dir. Noval. According to the guidelines, DILG Regional Memo Circular 2014-02, a “Hero” who must be present in a severely affected Barangay, Municipality or City during the Super Typhoon Yolanda, may be nominated several times by multiple people. To be eligible for selection for the Yolanda Heroism Award, a nominated Hero must either be a private, local or government official(s) and employee(s) who meet either of the categories. Acts of Valor. The recognition is given where the evidence presented shows that he or she saved human life at extreme risk to self. “Extreme risk” shall mean of greatest severity to one’s self or even at the cost of his/her life. The nominator will give consideration to resourcefulness and heroism demonstrated during the rescue operation. A major point to consider in this category is the number of lives saved from the water surge, debris, and raging wind during super typhoon. This award may be conferred posthumously, in behalf of the deceased nominee, to his/her legal heir or nearest kin. Acts of a Good Samaritan. The award recognizes notable acts of service that need not involve attempts of rescue or risk to self but has shown/performed extreme acts of selflessness and sacrifice. The individual has performed an act of service of rare or exceptional character that reflects an uncommon degree of concern for the well-being of others. The acts may include emergency relief/assistance such as, first- aid, food, clothing, temporary shelter, and such other acts that may lessen the impact of the disaster to the victim right after the typhoon. The length of time or number of hours/days of service may vary according to the need for help. The major point to consider here is the number of individuals or families who were accorded help and their general condition, stated the DILG Regional Director. The Regional Selection Committee shall be led by the DILG-8 Regional Director, with a civil society organization partner from the religious sector as Vice Chair. The rest of the panel will be composed of the Regional Directors of DOH, DSWD, DEPED, and a media representative. A similar setup will be followed at the provincial level, said Dir. Noval. A nominator must be at least 18 years old who has a personal/actual knowledge/account of the incident, an eyewitness or a rescued/assisted victim. All Nominations shall be forwarded to the local government unit(LGU) concerned duly noted by the LCE and shall then be recommended by the Parish Priest for submission to the Provincial Screening Committee (PSC). According to Dir. Noval, a nominator may only nominate one Hero and there shall be no self-nominations. Nominations must be submitted on behalf of another person who is not a member of the nominee’s immediate family. The nominator must provide the contact information, including email address and telephone number (whenever available) for the nominated Hero. The nominator must have been physically present in the Yolanda affected LGU during the Typhoon. The nominator bears the responsibility to write a summary of the event and complete the application in detail that pertains to the case (Please refer to the basic factors to highlight in the nomination write-up), using the prescribed YHA Nomination Form-01 with attached supporting documents, such as: Rescued/Assisted Person’s Statement; Eyewitness Statement; with accompanying photos or video, if any. Likewise the nominator must submit nominations either in English or in the local language. Nominators are asked to tell the story about the incident or the nominee in an inspirational, compelling manner that can in turn be told to the community. “Make sure to give details about how your Hero has dedicated his/her life during the Super Typhoon Yolanda so as to inspire other people,“ said Dir. Noval. They are also asked to include as much facts and supportive data as possible, including how many people their Hero has impacted or how many hours of service they have committed. For details and copies of the nomination forms, interested parties may visit the concerned DILG municipal or city office or the DILG Regional Office at Kanhuraw Hill, Tacloban City with tel. no. 321-2060 or 832-0894. QUEZON CITY – The Trade Union Congress of the Philippines (TUCP) chided Energy Secretary Petilla for his being inability to address brownouts and increasing electricity rates. The group, instead, proposes a declaration of national emergency on power so that the country will cease being a victim of the vicious cycle. TUCP described the “red alert” status issued by the Department of Energy, warning as to insufficient supply this weekend as the tip of the iceberg. “Our ship-of-state is sailing full speed ahead, in a collision course with the twin -peak iceberg of lack of power and MERALCO’s never-ending price increases. The DOE is placing our economic take-off at risk and is setting the stage for an impending economic meltdown,” said TUCP Executive Director Luis Corral. “The TUCP requests that the DOE Secretary to call a spade a spade and advice President Aquino that there is now an emergency in the power sector, requiring a multi-agency response with clear directions from the President, “said Corral. The labor center in a two-hour audience with President Aquino this April 30 requested the President to declare an emergency and establish a multi-agency group under him to address the power crisis. The DOE instead set up a task force study group which the TUCP and labor coalition Nagkaisa. Corral laid the responsibility with the DOE for not laying down clear policy parameters and accompanying strategies to ensure secure power supply or to define competitive rates. “The DOE doesn’t have these two items which can be technically defined by engineers, financial analysts and industry practitioners. In the absence of crisis leadership, electric power policy is veering from one Supreme Court case, still unresolved, to a new Supreme Court case, from ERC caps on a supposedly free-market activity to a more complex two price-cap mechanism and now to a pitiful DOE Task Force on Power Rates whose arcane and complex debates are further obscuring one central fact: That power Philippine Power Policy is in this climate of drift is firmly in the hands of a socially irresponsible and financially greedy power generation sector,” he explained. In the midst of this, consumers are supposed to rely on the oversight of an Energy Regulatory Commission headed by the Napoles-challenged Zeny Ducut,” said TUCP spokesperson Alan Tanjusay. “While there is a lack of secure and reliable supply, government should step in to put up additional capacity. If bilateral contracts between power distributors and generators will better lower rates and approximate true costs, then suspend the WESM until a technically developed percentage of supply reserve is set up to engender real competition. If there is cheap hydropower available during the rainy season, then run it instead of keeping it as ancillary reserve while the more expensive coal and oil plants are run,” Tanjusay said. He said this can be done without need of amending EPIRA,” All it takes is Presidential courage to announce an emergency and the need for a national response. Then all the players can be prodded, cajoled and otherwise mobilized to restore sanity to the electricity industry." The TUCP also called for an end to “blue skies” wishful thinking that somehow the DOE target to increase solar from 50 Megawatts to 500 Megawatts, will ease the burden of the supply deficit. Solar has at best an efficiency capacity at best of 20%, 500 MW really means 100 MW and that will never be large enough or reliable enough to be base load for large industries. Also, this will be done with a feed-in-tariff that will jack up rates by an average of 18 centavos per kWh for the next 20 years. "Solar seems to be the flavor of the month, Two years ago the flavor was privatizing the power barges and last year it was pushing generation sets. In Mindanao DOE could have rehabilitated the Agus Pulangui hydro-electric complex as demanded by Mindanawons, they did not , so the UP experts are predicting 200 plus days of brownouts for Mindanao next year. In the meantime the DOE rushed implementation of the Retail Competition and Open Access program which we fear will further drive up rates for the captive residential households of MERALCO,” Corral added. TUCP attributes the deflated 5.9% GDP growth rate in the first quarter as being driven by insecurity of businesses in our power supply. TUCP also attributed the inflation rate of 4.7% in May, the highest in 30 months, on the spiraling cost of power. They said energy officials preen with confidence about the manageability of our power crisis and yet we are made to pay for their failure of political leadership. The labor group said the country is hit by the triple whammy of spiraling costs of goods and commodities, an interruptible load program that allows Robinson's and SM to power up their generators to energize the lights and air-conditioning of their malls when there are NCR brownouts and be able to charge it to MERALCO customers, and now the real threat of retrenchments because businesses are losing because of no power and high power costs. TUCP has warned that the ASEAN Integration come 2015 requires a clear energy roadmap. "A wrong-headed energy roadmap will be fatal to all other industry roadmaps. If there is no power, there will be no investors and there will be no jobs," Tanjusay said. PASAY CITY – The Senate Committee on Finance has summoned Budget Secretary Florencio “Butch” Abad to explain before a public hearing scheduled for July 21 the controversial Disbursement Acceleration Program (DAP). The committee hearing is the continuation of the previous proceedings by the Senate that were suspended out of courtesy to the Supreme Court, which was then deliberating the various challenges questioning the legality of the DAP. The high court declared parts of the government’s spending mechanism unconstitutional. “You have been asking us which among our programs and projects were funded by the DAP… This is what we have been asking the DBM too since our last committee hearing: where is the list?” Escudero pointed out. According to Escudero, he would also ask Abad to identify the fund releases under the DAP that were considered unconstitutional by the Supreme Court. “If we want to scrutinize the DAP releases under the guidance of the SC decision, we need all the papers that only DBM can provide. We are entering the budget season and on the part of the finance committee, we are carefully studying the court decision to ensure that the next budget we will be crafting and approving will be compliant with the Supreme Court decision on the DAP,” Escudero said. CATBALOGAN CITY, Samar – In a ceremony conducted on July 9, 2014 at Calbayog City Convention Center, the Peace and Order Council (POC) of Calbayog City declared the city as Manageable Conflict-affected and Development-ready (MCADR). The ceremony was attended by Hon. Ronaldo P. Aquino, Mayor of Calbayog City; Rev. Niceas Abenoja of Calbayog City Diocese; Ms. Imelda C. Bonifacio, PAMANA Regional Manager of the Office of the Presidential Assistant for Peace Process; BGen. Wilson M. Leyva AFP, Commander 801st Infantry Brigade, other local officials of Calbayog City and military and police officers. The declaration of the City as MCADR was a symbol of desire of the Calbayognon’s for peace and progress. The declaration means that the basic issues that beset the people were already addressed by the City and concerned government agencies. It also means that the NPA rebel’s interference to the economic activity in the City is already negligible and can be easily address by the PNP. “The joint effort of the stakeholders depicted the treasured tradition of the Filipino people which is the true spirit of working together or “Bayanihan”. Let us not rest in our laurels, let us sustain the momentum, let us continue what we started and do not let the peace that we worked for be taken from our grasp again,” Leyva added. CATBALOGAN CITY, Samar – Army troops operating in Northern Samar encountered seven (7) NPA members in an operation conducted at Brgy. Acedillo, Victoria, Northern Samar on the dawn of July 8, 2014. According to Lt. Col. Arvin R. Lagamon, Commanding Officer of the 63rd Infantry Battalion, the presence of said armed men was reported by a concerned citizen at Brgy. Acedillo. While approaching said barangay to verify the report however, the government troops were fired upon by suspected NPA member prompting the troops to fire back. A brief firefight ensued afterwhich the rebels immediately withdrew. The encounter resulted to the recovery of one caliber .38 revolver, one caliber .38 pistol, two home-made 12 gauge shotguns and assorted ammunitions inside a vacated house occupied by the rebels. There was no reported casualty on both sides. Meanwhile, a certain Ronald Francisco, aka “Gaga” believed to be among the NPA group encountered by the government troops was positively identified by a concerned citizen from the same place. The suspect was arrested and was placed under the custody of Victoria PNP for further investigation. Follow-up operation against the fleeing rebels is ongoing as of press time. Maj. Gen. Jet B. Velarmino, Commander of the 8th Infantry Division lauded his troops for the success of the operation. “I commend the officers and men of the 63IB for the successful operation. I also would like to express my appreciation to the peace-loving citizen of Brgy. Acedillo who reported the NPA presence in their community”. “It is high time that all stakeholders, especially in far-flung areas to voice out their objection on the NPA presence in their communities. The message is very clear in Brgy Acedillo, NPAs are not welcome in their community. As the Commander of your Army in the region, I assure everyone that if we work hand in hand, we can flush out the remnants of NPA rebels from your communities and end their overdue terrorizing presence,” Velarmino said.